Inviting by E-Mail is an excellent way for asking new users to try our sites,Which is actually sent by their friends or contacts in Address Book.As Like as LinkedIn,Twitter Gets your Email address especially Gmail and Access all your contacts and Matches with Their Email Database and shows their existing users to follow(connect) and invite New users to try their respective sites.It means enjoying the site with their friends(Especially Twitter does this).Even i too joined LinkedIn and Twitter because of Invitation mail from my friends in Gmail via Twitter,LinkedIn. 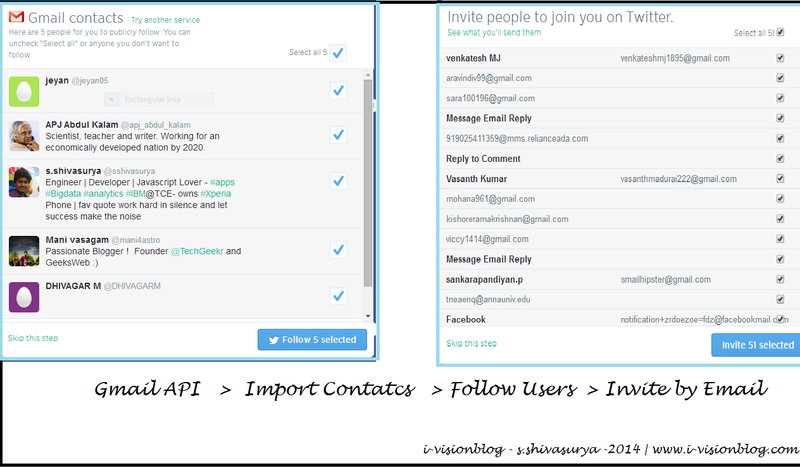 This is simple add-on Application for websites having Email users database.It is similar to Twitter,Linked Contact Importer where they get API access and fetch email from corresponding service and filter them accordingly as existing users and New users.and giving some options such as Follow or Connect and Inviting by Emails. Gmail API Contacts let you to Read,Update,Create Contacts in Gmail.Core part of the Contacts API below Here. //use the results to append to show the existing users to new users. may be error in ur array functions ! and check ur apache log for error paste the error here... and check twice u have email option to send via ur server! i can send email to users for password or registration purpose. and after submitting the output is array is null. i am helpless bro. i tried everything under my scope. Pls tell me thecode what i have to write in invite.js and anything to write in index.php of ur package. u have almost done ! i checked ur website populating fields well! only thing u must submit the value of check box as an array to maIl.php , that too i hav generated ! so now use ajax jquery to submit the checked box value as an array to mail.php and receive it $_POST['check'] and run with for loop ! if u r php programmer u can do it easily! still u need to full code ? @anjani kumar ! if so say me ! i will modify and mail u ! ya bro mail me the whole code. iam facing prblm in ajax submisson. i will mail soon! connect with me on gmail! hey bro you didnt send me the code. pls send it. i tried this code but nthng is happening.